Class Opener – Day 68 – Some Special Squares? A semester goes by so quickly under block scheduling, and after tommorow I only have 3 full weeks left with my freshmen. Many of them will move to Algebra 2 next semester, and I’m hoping to put them in a good place to remain successful in their high school math careers by thinking about the “why” – how everything we learn in math is connected, and form new connections when new ideas are encountered. These freshmen are one of our first groups to have had Algebra 1 in 7th grade, followed by Geometry in 8th grade. One difference I have observed with this structure is that my current 9th graders seem less confident with their algebra skills than past classes. I have to be careful with this generalization, as it’s easy to fill into a “the sky is falling” trap – maybe this year is really no different than previous years, but it sure feels that way. In particular, I sensed a good bit of uneasiness this week when multiplying binomials or factoring trinomials made an appearance during this past week of work on function operations. Next week, we’ll take a deeper look at polynomials as a segue into algebra 2. Today’s opener is taken from the awesome Nrich site, titled “Plus Minus”, and I hope to build some connections from their existing knowledge of “difference of squares” patterns. You can find many class resources for this problem there. I asked students to think about the equations on the board and tell me what they noticed. Does the information on the board help them generate any additional entries? 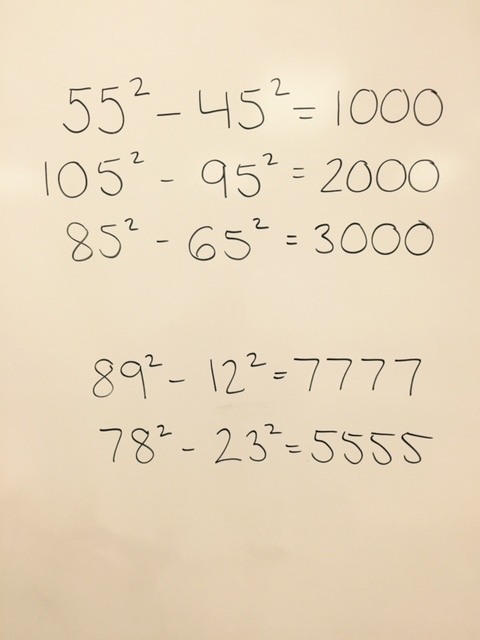 The class was divided into two camps: those who dove into their calculators to “guess and check” for more, and those who observes some patterns in both the numbers and the equations as a whole. The class did develop some additons to the list, but I didn’t notice many students making a connection to any previous knowledge….until…. Oh yes, yes, yes….tell me more…..please……. But the second half, where we look at the differences, was missing. I’m not going to force the issue yet, as I want them to find it. Later in class, we did a “read and recognition” activity to get unlock some of their trapped algebra knowledge. 10 questions, 30 seconds each, all relating to a factoring pattern. Many of their “difference of squares” cobwebs were dusted off, but we still have some work to do. We’re going to keep these inetresting number patterns on the board for the next few days, maybe we’ll add some to the list. It will be interesting to see how we grow in comfort over the next week!